As fresh rounds of floodwaters hit Sri Lanka this month, Muslim Aid is working on the ground to provide immediate emergency relief to communities affected by the disaster. In January this year, floodwaters struck Sri Lanka, displacing more than 325,000 and affecting over a million people in several districts. The new round of floodwaters have added extra hardship on communities as thousands more homes and livelihoods have been affected. 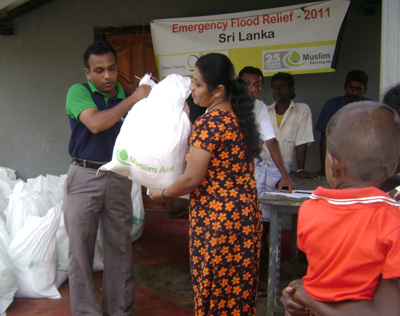 Muslim Aid Sri Lanka has distributed vital life-saving relief items; hygiene packs, food, water and purification tablets to essential items such as clothes and blankets to people in the worst affected areas of Batticaloa, Ampara, Trincomalee and Anuradhapura. Muslim Aid is also carrying out a ‘cash-for-work’ project for people whose livelihood has been severely affected due to the floods. The idea behind this project is to empower people by paying them cash to help in the clean-up operations. 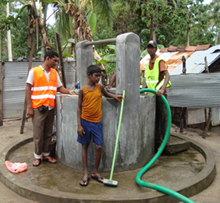 The hope is to continue with the relief activities and immediate future plans include a well cleaning project in the Batticaloa and Trincomalee districts.